Did I finish the sweater? In a word, yes. I bound off the last stitch on the subway home from the event on the very last day. So, needless to say, I didn't finish in time. But I had it with me every moment, and it certainly sparked conversation. Ariosa is a very loosely twisted merino and cashmere blend, and the balls of yarn themselves are like puffy little clouds of color. 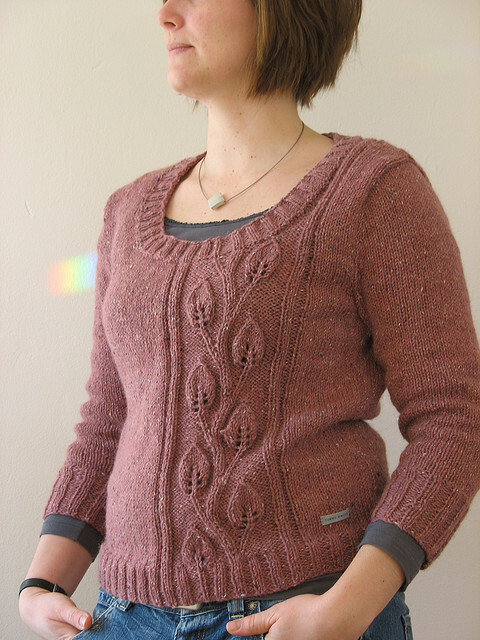 The sweater is chunky but not heavy, and its the softest thing you can imagine. 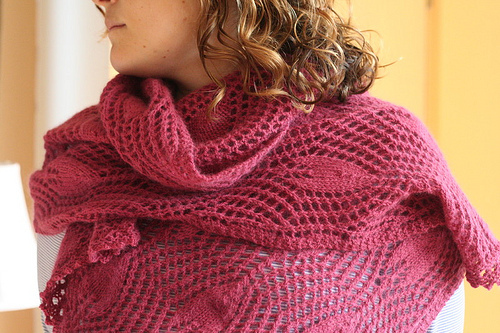 Ariosa definitely has a fluffiness factor that was magnified by knitting it at such a loose gauge (2 strands held together, knit on a US15 at 2.5 stitches per inch) but I also swatched it in my Continental Knitting class on a US8 to very different results. 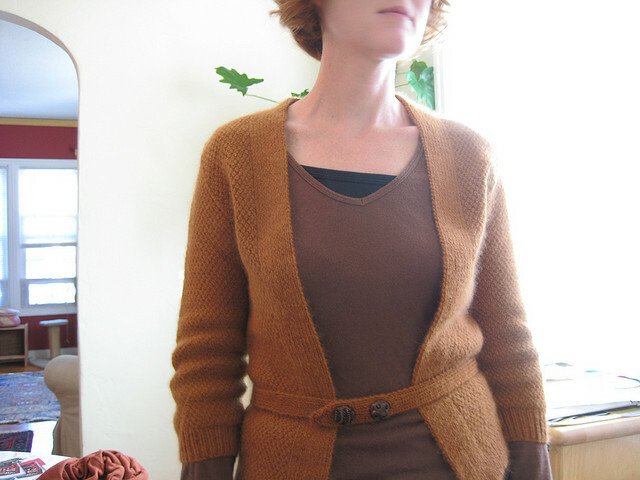 And Sweater Three, fastened with a stray DPN. I did buy some fabulous buttons from my new friend Denise of the Yarn Garden in CT, but was waiting until it was blocked to add them. Vogue Knitting Live was a great experience! I was starstruck by some of the knit-celebrities I saw-Wenlan Chia, Anne Hanson, Sarah Hatton, Shannon Okey, Stephanie Pearl-McPhee (this one really had me tongue-tied), Franklin Habit, Josh Bennett, Ysolda Teague, the list goes on. As of Saturday morning, there were 3,000 participants and classes were 95% sold out. Marketplace tickets, which were on sale at the registration desk for those who just wanted to shop, accounted for another thousand or so attendees. I worked the registration desk on Friday afternoon and got to meet many of you. I was thrilled to see how diverse the crowd was--there were women and men, young and old, New York ladies dressed to the nines and alternative chicks with tattoos and bandannas. There were a few native New Yorkers, but many people traveled looooong distances (some were foiled by the big snowstorm). I met people from all over the world, and wish Vogue gave a prize for the longest distance traveled; it would probably have gone to one woman there from Australia! The marketplace was incredible. Two floors of independent dyers, yarn shops, fashion shows, demos, and art installations, open all weekend long. There was a five foot long knitted whale suspended from the ceiling! Vogue did a great job of making sure there was always something to see. Classic Elite sponsored a "Beginner Bar", inspired by Apple's Genius Bar, where people could learn to knit and otherwise get knitting help. I was approached by a woman on the Hilton staff who is a crocheter but was inspired by all the beautiful garments on display. I sent her straight to the "bar" to get a lesson! 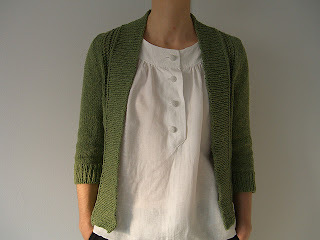 I was happy to see some new knitters in my classes. That was a true sign that people are picking it up and feeling energized and passionate enough to spend the money on a weekend knitting event. I gave two impromptu Magic Loop lessons. It seems to be something people really want to learn, should I do a tutorial here on the blog? New York City was a vibrant host. 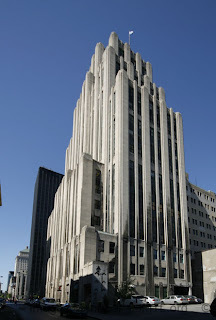 It's my hometown, so I might be a little biased, but what better or more fashion-forward place could Vogue have chosen? Betsy, Heather and Susan went to a lecture on Thursday night to hear Isaac Mizrahi and Mark Morris talk about costume design in his dance company, I (almost) went to a live Moth* show, and finally visited some of the New York LYS's whose emails I receive. I saw some swing dancing in the Times Square train station, and shot a short video which you can see on our Facebook page. Then I did some shopping in Soho. I would love to hear from any and all of you who attended this weekend! What was your favorite part? What was your experience like? What shops did you visit? *The Moth is a podcast of people telling stories about their lives without notes. I highly recommend it. By the time I arrived a half hour before show time, there were 600 people in line. 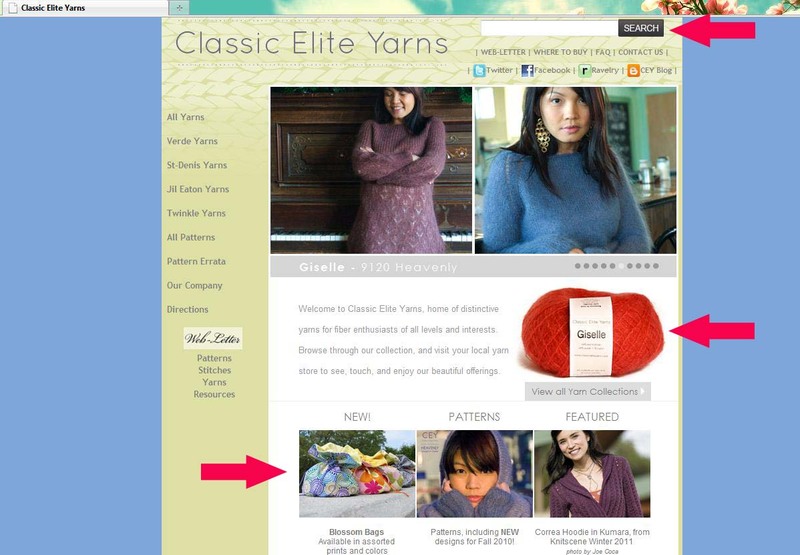 Same company, same beautiful yarns, new online presentation! Anyone who has been on our site in the last few months or so has seen some changes that make it much easier to find our yarns and patterns. A "Search" function that enables you to type in just about anything to bring up all the pertinent information--yarn, patterns, booklets, you name it! A slideshow of patterns from our current season. Because the slideshow wasn't built using Flash, you can even view it on most mobile devices. Boxes with rotating selections of news and other goings-on here at CEY--magazine patterns, new products, promotions, anything we think you might want to know. Once you type in your search command (I chose Ariosa), you're taken to a page like this one. 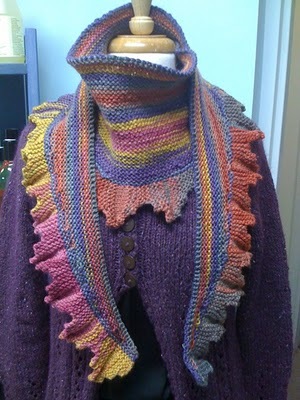 The yarn is listed at the top, and patterns underneath. 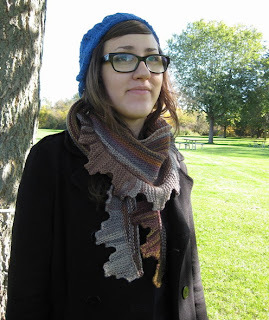 One of your choices is free patterns in that yarn (who doesn't love free patterns?) Next are some booklets with pattern support. Booklets from previous years are not organized by yarn, so this is very helpful when browsing older collections. 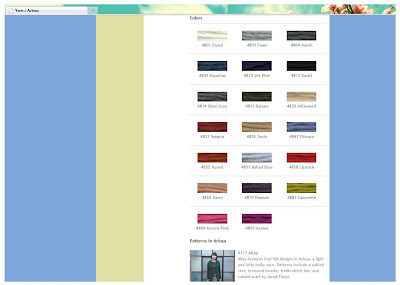 Our yarn pages are also different! 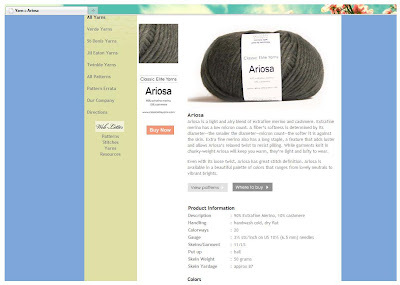 There is now a beautiful close-up of each yarn with a descriptive paragraph and ballband information listed below. 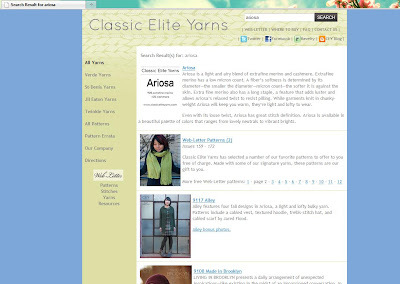 You'll find a list of suggested patterns and booklets here also. If you remember the old format, our yarn colors were displayed on what are called "sticks", long dowels with a few strands of each color looped around it. We now have each color individually pictured and labelled. We hope the new look is a little clearer and easier to read! Let us know what you think. Any other changes you'd like to see? Ok, its been a while, but the Ravelry Roundup is back! Today we have a very "Marimekko" graphic bird blanket, a Classic Silk Open Cardi, a stunning Climbing Vines pullover in Portland Tweed, and two Fresco projects that play with their patterns' recommended gauges, a fine-knit Minimalist Cardigan, and a reinvented Muir. Hopefully after today's Web Letter, you all have Liberty Wool on the brain...Liberty Wool knits up at 5 stitches to the inch on a US7, making it the perfect machine-washable worsted weight yarn, available in 16 colors and 5 prints. In fact, one of our stores now stocks it as their go-to washable standard! The icing on the cake, however, is the prints. Liberty Prints are stunning multicolored versions that knit up in a rainbow of stripes. The colors range from fin to sophisticated (my favorite is Rainforest, our newest colorway). Have you seen this gorgeous scarf in Liberty Print? Our friends at Patternfish sent over the link, and I love it! 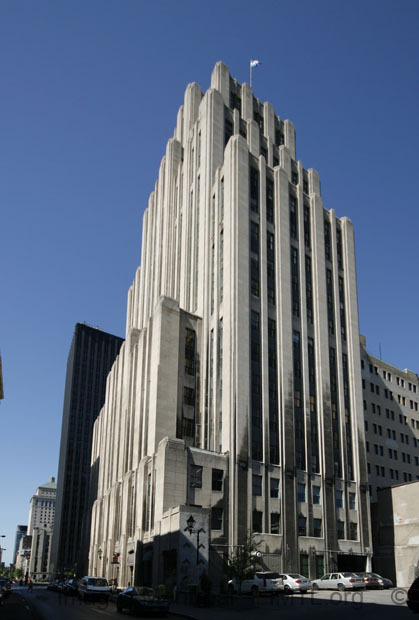 The notches on the edge have a sort of architectural effect, hence the name, "Aldred Scarf", named after the Aldred Building in Montreal, Canada. See the resemblance? Our friends over at A Really Good Yarn knit up two versions! I spent much of this weekend thinking about my knitting New Year's resolutions this year--maybe if I document them here, there's a better chance I'll actually accomplish them. 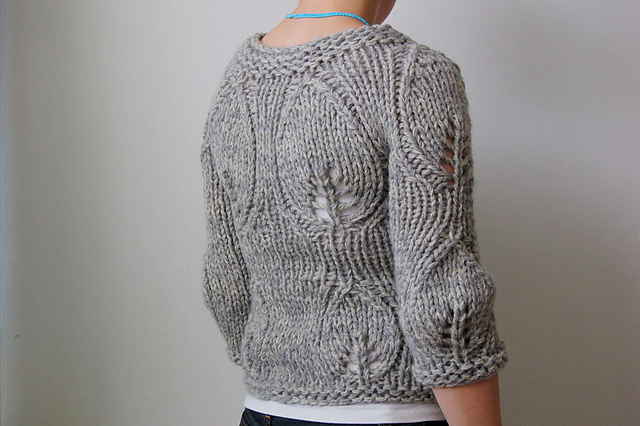 I learned to knit during the summer of 2008 and have made major progress over the last two and a half years, but I'm hungry for more knowledge, more yarn, and more knitting! 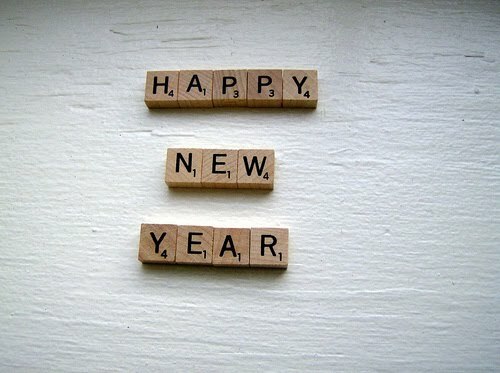 I would love to hear some of your crafty resolutions too, I'm always looking to add to the list. 1. 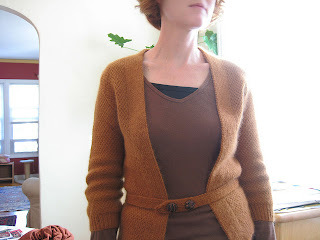 Learn to knit Continental-style. There are just too many patterns that I want to knit in this world. And from what I hear, picking is much faster than throwing. I think I'll start with a felted bag, something where inconsistent tension will have very little bearing on the look of the finished item. I really like Noni's felted bags and flowers, especially her Tulip Tote. Hopefully I'll be carrying that to the office this summer. This has been on my list forever. Every year, I think I am definitely going to Rhinebeck this year, or a knitting retreat, or a cruise, or an educational weekend (I was so jealous of everyone who went to Squam. Definitely on the calendar in 2011). This is my year, and I'm starting with Vogue Knitting Live in just a few weeks! I'm taking two classes and am volunteering for the event. That means I'll be registering some of the fine attendees and working the reception, even assembling goodie bags. Will you be there? I would LOVE to say hi to some of our blog readers, so if you see a woman with a name tag that says "Chelsea", say hi! Well, maybe not all of them. I'm thinking about limiting it to projects that take over 400 yards of yarn. What do you think? I've knit so many sweaters and shawls in the last year, but my Ravelry notebook is so...meh. 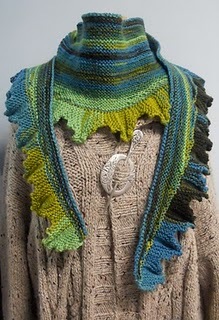 This would give me an opportunity to work on my knit photography and a chance to pay it forward--I almost never cast on a project without first looking to Ravelry for inspiration and tips. I owe it to the Ravel-verse to contribute my own.